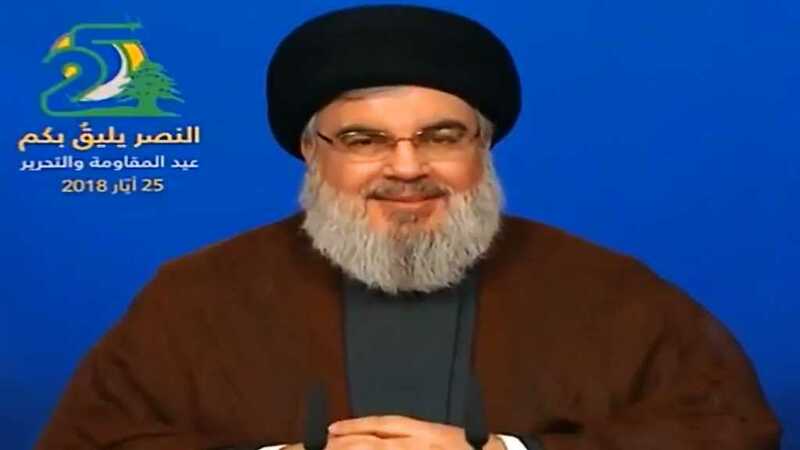 Hezbollah Secretary General His Eminence Sayyed Hassan Nasrallah confirmed that this year’s Al-Quds Day should receive great attention at all levels in view of what the Holy city is facing, especially after US President Donald Trump’s to recognize it as the capital of the occupying entity. In a televised speech on the 18th anniversary of 2000 Liberation, Sayyed Nasrallah highlighted that the anniversary is a very important and national one i.e. full of lessons. “The heroic fighters, martyrs, wounded, liberated prisoners, general public, Lebanese Army, security forces, resistance factions and the Syrian army are the ones who are credited with this achievement,” His Eminence added. He further hailed the Syrian and Iranian support so that the 2000 liberation was accomplished. “We are living in safety, dignity and freedom thanks to this victory,” Sayyed Nasrallah mentioned. In addition, Sayyed Nasrallah confirmed that the Resistance is confident of victory in any upcoming war. Commenting on the recent US-Gulf decision to blacklist Hezbollah and its leaders as terrorists, Sayyed Nasrallah played down the step. On this level, His Eminence went on to emphasize that the Lebanese government has responsibility towards citizens put on US terror lists and must not abandon them. “The Lebanese government had a responsibility to all its citizens placed on US terror lists and that some of those affected were not affiliated and did not give money to Hezbollah. As they’re Lebanese citizens, the Government should defend their rights. They should reject the sanctions,” he confirmed. “When you defeat the invincible “Israeli” army, when you advance a cultural change in the region, and stand in as an obstacle in the way of US and “Israel” schemes in the region and contribute to foiling them, it is natural that the s enemy will threaten you,” he explained. In addition, Hezbollah Secretary General praised the fact that people from diverse Lebanese societies proved their loyalty to the Resistance by voting in favor of Hezbollah during May 6 parliamentary elections. On another level, Sayyed Nasrallah congratulated the Syrian leadership and people on the liberation of Damascus and its entire countryside. “I had previously said that the Syrian leadership and their allies would not let Damascus fall, whatever the sacrifice. Today, we also turn to Syria, its army, its people and its allies to welcome the liberation of Damascus in its entirety,” he added. “We are calling for a speedy government formation because this is in the country’s interest and because there are major files that need to be addressed and the all the developments in the region are in our favor,” Sayyed Nasrallah added. “Hezbollah didn’t and will not demand having one of the so-called sovereign ministerial portfolios,” His Eminence stressed. According to him, There are parties with whom we may disagree strategically, but nothing prevents from cooperating with them in fighting corruption.